If you eat, drink, and sleep football, then why not travel and shave with it too with this cool new No. 7 Football Shaving Kit from Colonel Littleton. Forget pigskin, because this brown leather 1920s football-inspired shave / dopp kit is handcrafted in the USA from vegetable-tanned steer hide. 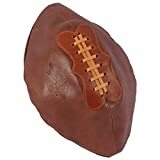 It features a traditional football laces on one side, a handy zipper running all along the backside, a waterproof inner lining, and a zipper tag that can be personalized with your initials. Not only does this sporting shave kit have a great grip, I bet you could even load it up with all your needed travel toiletries and still throw a perfect spiral, but I don't recommend it.